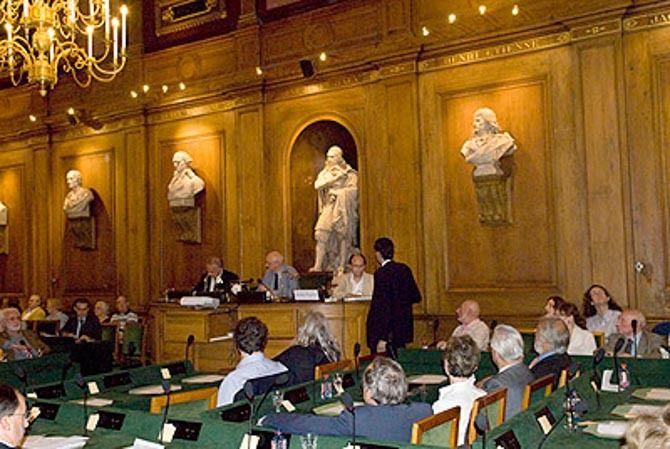 Yesterday, Jean-Louis Marignier, researcher at the CNRS and scientific consultant at the Maison Niépce at Saint-Loup-de-Varennes, presented a conference on the “origins of photography, Nicéphore Niépce” at the Academy of Fine Arts in Paris, thus rehabilitating the real inventor of photography. During the summer of 1839, responding to the invitation of Arago (a French scientist and politician), Daguerre presented his daguerreotype at the Academy of Sciences, and it was then that the invention of photography was officialised. Nicéphore Niépce, who had died six years before, had been totally forgotten. And yet, Daguerre had worked with Niépce and proceeded with his findings. But the first person to have captured and fixed an image thanks to light, the real inventor of the photographic principle, was Niépce, there is no doubt about that. Daguerre only simplified he process, making it accessible to the public. Jean-Louis Marignier has spent a long time studying the method of Nicéphore Niépce. He demonstrated it yesterday at the Academy of Fine Arts at the invitation of the photographer Lucien Clergue, who is a member of the Academy and the creator of the “Rencontres d’Arles” (the biggest photographic event in the world). “This is something of a historic event for it is the first conference on photography since Arago announced, in this same room, the invention of photography in 1839”, explained the academician before letting Jean-Louis Marignier speak. “Arago presented the first usable photographic procedure”, stated the lecturer, first detailing the life of Nicéphore Niépce, who also invented the internal combustion engine and the injection principle. He then presented his research that has led him to discover and reproduce the device used by the inventor to execute his first prints, among which his famous “Point de vue du Gras”, the oldest photo in the world taken in 1827 by Nicéphore Niépce in Saint-Loup-de-Varennes and kept today in Austin (Texas). The researcher then described his studies on this famous picture, thanks to which he has been able to determine the exact location and the time of the year when it was taken. His very precise and solid work, backed up by some astonishing virtual demonstrations, appealed to the academicians who found the conference “outstanding”. Jean-Louis Marignier commented as well on the discovery of the oldest photo laboratory in the world, which was found last year in the region of Châlon-sur-Saône in a nearly intact state, and the elements of which are now shown in the Maison Niépce. This house situated in Saint-Loup-de-Varennes, from which was taken the oldest photography in the world, could very well host the visit of the members of the Academy of Fine Arts in the upcoming months, a project initiated by Lucien Clergue, who has been a close friend of the manager of the Maison Niépce, Pierre-Yves Mahé, for many years. This conference and the publications that will follow at the end of the year constitute an official acknowledgement of Niépce and of the crucial role that he played in the invention of photography.